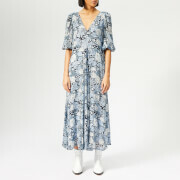 Ganni wrap dress with an all-over floral print. Cut from the finest mesh fabric to form a sheer, lightweight midi dress, the 'Tilden' dress represents the brand's ability to create modern yet playful pieces. An elegant wrap front with self-tie waist belt forms a flattering V-neck silhouette, while an asymmetrical hem with delicate pleats lends the dress subtle fluidity and volume. Sheer puffed sleeves with elasticated cuffs complete the design.